As I pulled up to 2631 Freesia Drive in Summerland, I saw two riders on horseback silhouetted against the sky, riding along the ridge above the house. Apparently horses are not an unusual sight for this neighborhood, but it’s not something I see every day in downtown Santa Barbara. So I immediately had the feeling that I was someplace special. The entire neighborhood has a bit of a country feel. There’s a quiet hillside park below the house with picnic tables and a view of the ocean. Around the corner is the Greenwell Preserve with miles of hiking trails and open space. The closest commercial building is a little business at the end of the lane with antiques, garden art, jewelry, and a private retreat house aptly named The Sacred Space. It’s no wonder that this entire area feels charmed. The house itself is part of a 20-residence enclave built in 2001 called The Cottages at Summerland, located at the south end of town, apart from the bustle of the main street but close enough to enjoy the shops and restaurants in just a short walk. Walking through the front door, I found myself on a landing several steps above the living room. This grand entrance provides a welcoming preview of the living space below and the compelling ocean view beyond. I can see right away that there is nothing cookie-cutter about this house, from the plentiful multipaned windows to the rich, natural bamboo floors. The kitchen’s beautiful granite countertops and large island beg to be shared and enjoyed as a central gathering place in the heart of this home. 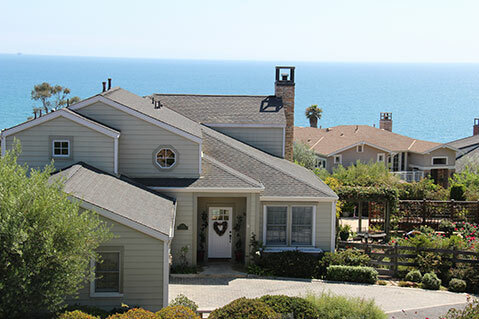 The expansive ocean view entices me outside, and I realize one reason for the extra-special quality of this particular vista: Unlike most of Summerland, the view from the cottages is completely unobstructed. No power lines interrupt the panorama of the sparkling channel and the islands beyond. With large decks both upstairs and down, the view from this home will always remind its residents to slow down and relax. I might have gazed out at the ocean all day, but another special feature caught my attention. The entire side of the house is a magical garden with more than 40 rose bushes, a flowering trellis, and natural rock pathways. The space is manicured and yet still a bit wild; it feels as if it will reveal its secrets slowly over time. The garden and the entire yard are completely fenced, and since the home is situated on a corner lot, it feels private and worlds away. I drove away feeling as though I had been introduced to a home that could become an old friend. With three bedrooms and two and a half baths spread over two stories, this house is spacious and airy yet still comfortable and cottage-feeling. Its sunny corners, inside and out, feel ready to welcome a new owner to enjoy it and make memories for generations to come. 2631 Freesia Drive is currently for sale in Summerland, listed by Fred Bradley of Sotheby’s International Realty. Reach Fred at (805) 689-8612.